We hope everyone enjoyed a relaxing festive season. We’re excited to start our year by hosting Perth’s Global Game Jam 2013! It’s just under 3 weeks away and you can register for this event by signing up to the Global Game Jam site and joining our Perth Site. Here are some chunky-sized details to help you plan out the 48 hour event. Parking: Free after 5pm on Friday, and for the entire weekend. Park in bays marked: staff, students or visitors. Internet: Wireless internet available at venue, please see one of the organisers for login details. 6pm: Clean up, pack up and finish! 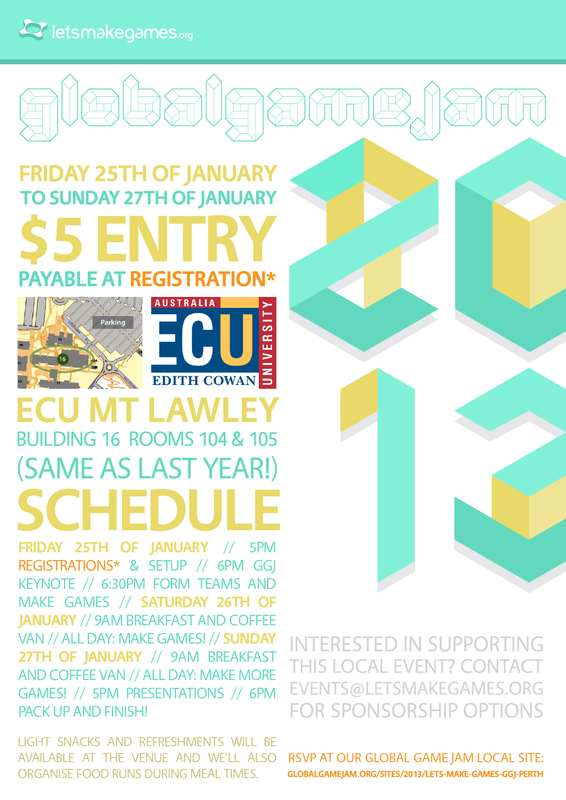 If you have any questions or are keen to support/sponsor this event, please contact events@letsmakegames.org. I’ve been wondering what age you classify as a minor, who have to have parents that attend the event. At 16, I don’t think I would classify as a minor and just wanted to clarify this before the event. Hi Jayden, in Australia, I believe you are a minor if you are under 18 years of age. I’ve sent you some info about attending the event. Feel free to ask us if you have any more questions. Aranda: Yeah we have actually, you’ll have to give us your HO on this guy too 🙂 Thanks for the hot tip!